While there have been more than 3 million babies born from the assisted reproductive techno-logies (ART) worldwide, success in a cycle is not guaranteed. In an effort to overcome inefficiencies in human reproduction, additional embryos are often transferred into the uterus, increasing the risk of multiple pregnancies. Despite the transfer of supra-numerary embryos, the probability of achieving pregnancy is less than 50%. 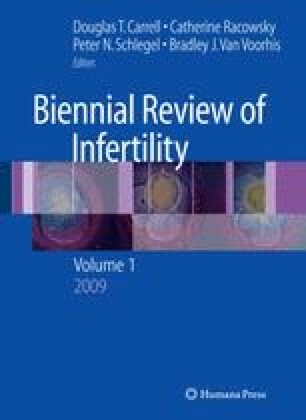 Pre-implantation genetic screening (PGS) has been utilized by some programs in addition to standard IVF procedure in an effort to increase delivery rates in patients with poor prognosis for conception (advanced maternal age or prior failed IVF cycles) or to reduce the chance of subsequent miscarriage in patients with a history of recurrent pregnancy loss. Additionally, PGS has been used in an attempt to select the “perfect” embryo to reduce risk of multi-fetal gestation. Due to difficulties with the technique of fluorescence in-situ hybridization (FISH) used to detect aneuploidy in embryos, as well as biologic limitations of embryonic development, the goal of increasing live birth rates with ART does not appear to have been reached. In fact, in two randomized controlled trials, PGS might actually have had the opposite effect and reduced a woman’s chance of having a child. Society for Assisted Reproductive Technology. 2006 (https://www.sartcorsonline.com/rptCSR_PublicMultYear.aspx?ClinicPKID=0).